Uber is the near magical mobile app that allows you to identify, summon and pay for a town car all as if you’re a member of a cool secret club. Drivers use their own smart phone t accept requests, call on arrival, bill, and receive rider reviews. There are some interesting regulatory issues – the the experience of its use is pure mobile magic. How cool would it be to have something like that for getting plow to appear to clear your driveway? Imagine being in the middle of shoveling, you find its more than you expected, and you simply push a button and go inside for a hot beverage. That’s the magic of Plow Me. And that’s the dream taht Yeh Diab of Weymouth, MA has been working on delivering since he started work on Plow Me about this time last year. Since then, he’s recruited over 100 drivers from the Boston Metro and Chicago area. 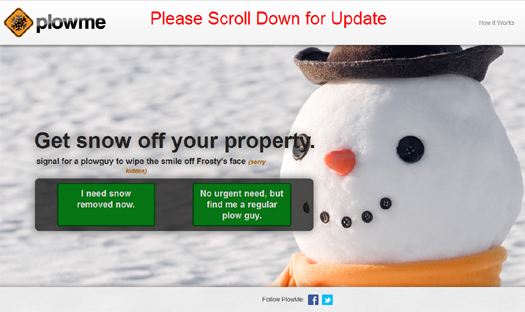 The website allows visitors to request single time snow removal, or set up an automatic request – so they can loose the snow even without visiting the site. Marketing Risk: Most drivers are part-time, so marketing themselves is expensive, and the investment just increases their risk of loss if there isn’t any snow. Inefficient Routes: Residential plowing is spread out, so drivers pass driveways that need plowing to get to the one which called them specifically. The pain of payment: Plow me lets buyers offer a price and pay by credit card. Plow Me works to optimize this entire business design, making residential plowing more efficient and profitable for drivers, and more rational and enjoyable for those who’d rather not shovel. The consumer interface is a website based application, and the mobile application pictured to the right is how their mobile workforce spots and takes requests. 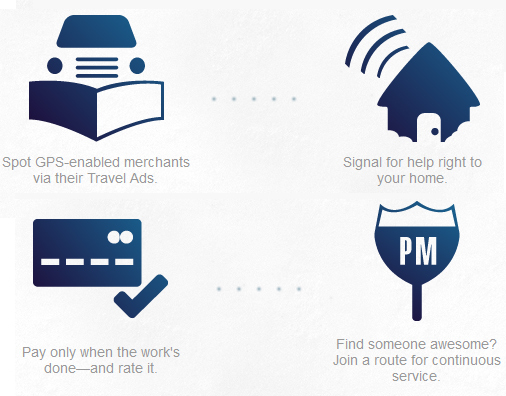 PlowMe aggregates the market, lets drivers pick the most efficient work, and they facilitate pay for a simple 20 percent off the top for any one-time work they generate for driver. If the account elects automatic plowing, they take 50 percent for the first plowing, and 10 percent off subsequent storms, which makes account retention and satisfaction a priority for drivers. Did you notice the social media links on their home page, up above? That’s key. Imagine how effective social media marketing would be for promoting this digital offering. When a snowstorm hits a region with Plow Me in it, a single marketer could monitor tweets about the storm and what a pain shoveling can be. Then, all they’d need to do is offer a discount code (or a few few trials to connected early adopters) to get great viral word of mouth. The same marketer could work multiple storms, and ideally also get deals in place to buy ads next to weather reports and school closings on online properties. The moat protecting Uber’s and Plow Me’s business is category leadership based on successful experience design that earns that position as first, best and always. Once the trademarked Plow Me defines this new category, just as Uber does in transportation, then they’ll be the coolest business on snow. Today, it seems like they already are. 3 Responses to "Plow Me: Its Uber for Snow Removal"
I need my driveway plowed as soon as possible, please contact me when u can.